A lot of things went wrong in Canada, sure. But perhaps the worse of our issues were the servos. The other day, we were planning on running a short demo during the regional RoboCup competition. We all got to school on Saturday and began putting it back together again. However, we didn’t have four functioning Dynamixel AX-18A servos. We eventually found four functional AX-12W servos. These are faster but less torquey than the 18As. I tested each servo and gave them the appropriate IDs. Then during the moment of truth, one of the servos began giving an overheating error. Man, this reminded me way too much of Canada. So we decided to replace the back two servos with 18As. But, we discovered that the 12Ws were way faster than the 18As. With enough time, we could have worked out the difference in speed and rewrite the code to use the speed factor. And so, we again took all the servos off the robot and replaced them again. This time, we found four 12As. These are like the 18As but less torquey. I don’t even know what the problem is but seriously, the amount of servo issues we’ve had, I think we may have fallen victim to an ancient curse. We didn’t end up doing the demonstration that day, and we left with nothing but disappointment in our hearts. That’s right, by a sheer stroke of luck, excluding the servos on the robot still, we had an equal number of working and non-working servos. 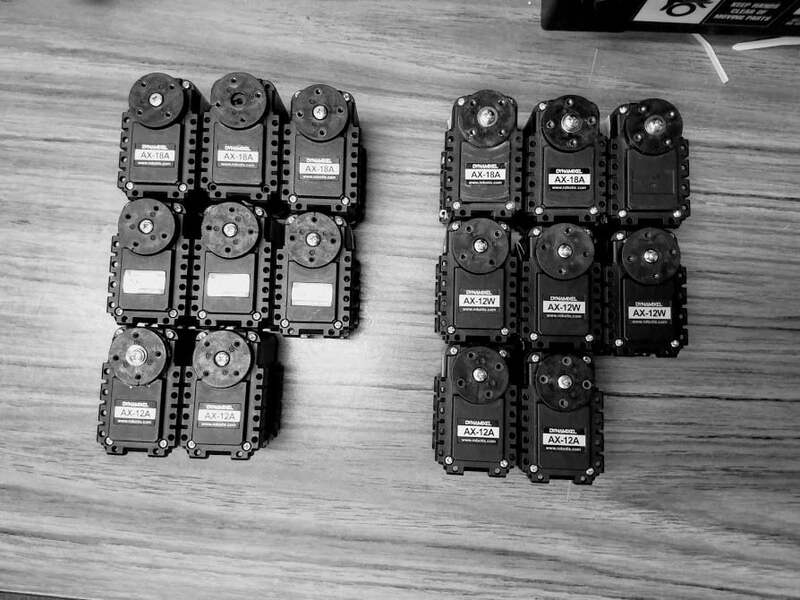 We also had an equal amount of each servo. i.e. 3 broken and 3 working 18As, etc. servo reports an overheating error. So what do we do? We’re gonna try to fix as many as we can, because they’re rather expensive. If not, well, I guess we’ll need to buy some more. Yep! And that’s not even including the four still epoxied to your robot!